For wellness programs to succeed, the support of management is critical. But company leaders aren’t just responsible for choosing programs, approving budgets, and getting the ball rolling. They must also be prepared to give employees the support and encouragement needed to create a culture of wellness and positive change. 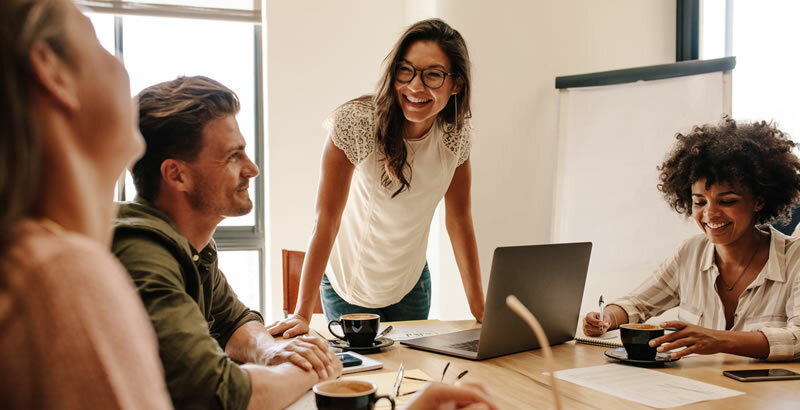 When management takes employee wellness seriously and works to foster a culture of wellness, it can result in amazing transformations to the work environment, productivity, and retention, and to each employee’s life at work … and beyond. Well-being (or lack thereof) at the workplace has a ripple effect beyond the office doors. Despite the importance of leaving work at work, in reality, few employees can shut their computers off at 5 p.m., leave the office, and forget about work until the next morning. Instead, they’re agonizing over deadlines, replying to late-night emails, and worrying how the latest round of budget cuts will affect their position. Similarly, if an employee is experiencing difficulties or stress at home, it’s very difficult to “turn it off” when at work. All this pressure makes achieving a work-life balance seemingly impossible. And the stress of trying to do it all is becoming one of the top risks to employee health. That’s where managers can help. Managers are in the unique position not just to help employees manage stress better, but also to reduce and transform stress levels. To do that, however, they need to examine how they might be contributing to that very same stress. Many managers may openly support wellness, but then act in ways that tell a different story. Laura Putnam, author of Workplace Wellness That Works, CEO and founder of Motion Infusion and creator of Managers on the Move, is authoring a book on this subject (as well as addressing it in her keynote at WellRight’s User Conference). She points to sending late-night or weekend emails as a prime example of actions speaking louder than words. Managers might send 11 p.m. emails in an innocent effort to get a head start on the workweek or to dash off a quick note before they lose their thought. But the direct reports receiving those emails take that as a cue they should also be working during off-hours. As a result, employees can feel as though they’re on call 24/7, speeding up the corporate culture, increasing the potential for stress and burnout, and decreasing true productivity. What needs to change, then? Communication. Managers may talk about wellness programs and other benefits, but that’s very different from fostering a culture of wellness. If you’re wondering if managers really can effect major change, look no further than Gallup’s study on engagement. In it, they found that managers account for up to 70% of the variance of their team members’ engagement in both work and wellness. “When management becomes an enthusiastic agent of change for wellness,” Putnam explains, “the transformation of the workplace can be really dramatic.” The research also bears this out: When 251 managers took part in the Managers on the Move program, learning how to promote multiple facets of well-being among their teams, their team members reported improved productivity, engagement, and other aspects of wellness. Offering a robust wellness program and a flexible workplace is a fantastic start, but managers also need to back this up with support, enthusiasm, and modeling. If a workplace offers an Employee Assistance Program, for example, employees are much more likely to feel comfortable using it if their manager talks about how he or she used it to work through some recent issues. Or, the manager can start conversations about the wellness challenges they’ve been working on, or a coaching session they had, which normalizes wellness efforts and gives staff clear consent to pursue their own wellness. Even simple acts can make a difference: Putnam tells of a manager who changed her in-office one-on-ones to outside walking meetings, resulting in employees becoming more receptive to coaching. She also mentioned a team at a secure mental health treatment facility who starts each shift meeting by naming three good things, rewiring their brains for optimism. Avoid inflicting unnecessary stress on employees by respecting their work-life balance and autonomy. Encourage and support employees to take advantage of wellness programs and other workplace offerings. "No matter what is happening in the organization, managers need to realize that they have the capacity to carve out an oasis of well-being for their team." Because our work environment is so influential, Putnam reminds us, creating a workplace culture of wellness plays a vital role in how employees engage in well-being. When it comes to creating that culture, middle managers play an important role. Not only must they critically examine their own management practices to see how they contribute to workplace stress, but they should then focus on creating a work environment that demonstrates how the company truly, deeply cares about the well-being of its employees. By doing that, managers can find themselves with a fiercely loyal, happy, and productive team that brings the organization to new heights of success. Help your managers become the multipliers of well-being and connect with employees. It’s an effort that isn’t just good for the organization as a whole—it’s also essential for building a winning team. Download our free ebook, “8 Ways to Foster Employee Growth and Engagement With Your Wellness Program,” to learn how to help your managers create an environment that supports personal growth.